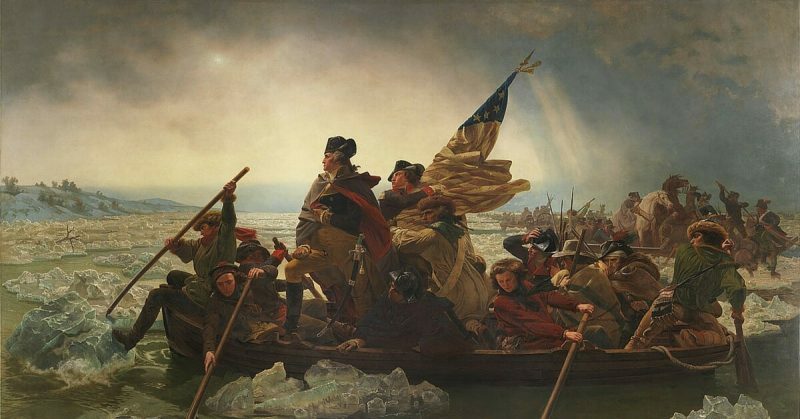 Crossing the icy Delaware was no small task, as evidenced by the surprised Hessians, not expecting that the revolutionaries would attempt the crossing. In War, surprise attacks, traps and ambushes can help to even the odds in an otherwise uneven fight. Guerrilla fighters can cause terrible damage both militarily and politically with well-timed attacks. When numbers are more even, a surprise attack can cause so much devastation in one battle that it can end a war. Other surprise attacks were covered here and future articles will likely cover more. Here are a few examples throughout history. 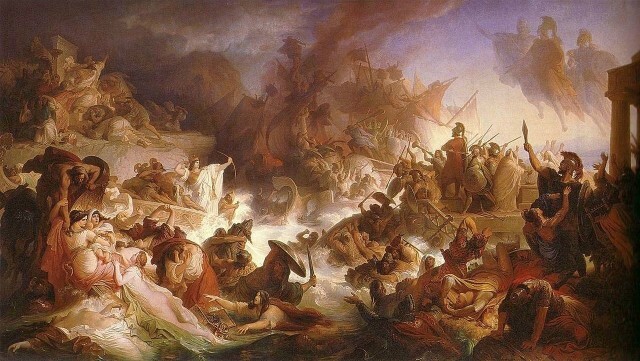 This painting does a great job showing how compact the battle of Salamis was. Though Pearl Harbor is the most well-known surprise attack against a navy, it was far from the most decisive as the U.S. was able to recover to win the war. The Greek naval trap at Salamis, however, crippled a previously unstoppable juggernaut that was Persia. After bursting through Thermopylae, the Persians had free reign in northeastern Greece and proceeded to burn the abandoned Athens. The Greeks were prepared to fight at the Isthmus of Corinth but had little hope of success if Xerxes was free to simply land troops behind the defensive lines. Stopping the navy was a tall task as the Greeks had less than 400 ships facing twice as many Persian ships. The Persian navy wasn’t full of amateur sailors either; Phonecians with a proud naval tradition were part of the fleet along with Ionian Greeks. Xerxes hoped to chase the Greeks through the narrow straits around the island of Salamis and trap them at the exit; the Greeks had other plans. The Greeks hid in one of the first hidden bays in the strait and prepared themselves for the fight while aligning their ships to attack with the wind. Once the large Persian fleet entered the strait the Greeks smashed into their flank, keeping the encounter in tight quarters. Multiple ships smashed into huge masses of decks and shattered oars as the Greek’s surprise attack got them the upper hand. As the battle continued on, the Greeks sunk more and more ships. Greeks who were shipwrecked could go to friendly shores while the Persian survivors were cut down before they even got off the beach. With this victory Xerxes left the invasion in the hands of his generals and the bulk of the threat was over; later finished at the battle of Plataea. A little later into history, we go to the Byzantine Empire of the 9th century. Emperor Nikephoros was personally leading his troops into Bulgaria to capture the barbarian capital of Pliska. Bulgaria, under the leadership of the warlord, Krum, had been a menace to the Byzantines for years, so Nikephoros gathered an army of about 80,000. This massive force quickly marched through the Balkan Mountains and captured the Pliska. Krum sought peace, but his overtures were ignored by Nikephoros, who continued to completely devastate the Bulgarian capital. Krum decided to gather a huge army of men from the countryside, including women, and mercenaries and rigged traps and walls on the mountain pass back to Byzantine territory. when Nikephoros and the victorious army headed up the pass they noticed several traps and eventually their progress was blocked by a wooden palisade with Bulgarian warriors on the heights. Before the Byzantines could turn around, more Bulgarians swung down to block the exit back to the open valleys and fields. Nikephoros could not decide what to do and despite his generals urging to fight through to the valley, Nikephoros decided to just set up camp. This was the best outcome for the Bulgarians as they shored up possible escape routes and surrounded the camp. In the morning, fierce attacks scattered the Byzantines who ran in multiple directs to escape. Many men ran into high walls and tried to climb over, but landed in deeply dug ditches on the other side, breaking legs and making it easy for the waiting Bulgarians to dispatch those who made it over. Flooded and muddy rivers also slowed progress and the Bulgarians were able to catch up and destroy almost the entire army. Nikephoros was killed and his son was fatally wounded. It was widely reported the Krum had the skull of the emperor plated in silver and used it as a drinking cup. Though the actual attack was not a surprise, the Bulgarian occupation of the pass certainly was. It allowed an almost entirely defeated people to absolutely destroy an imperial army and keep the fight going for at least a few years longer. 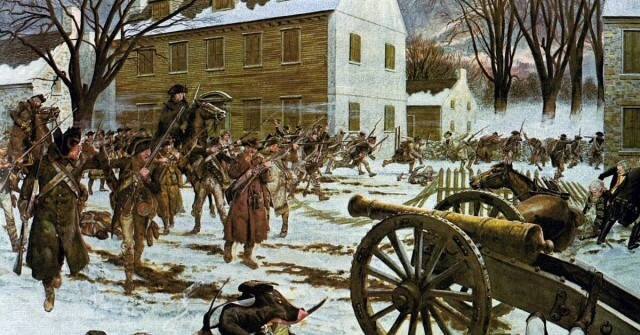 Despite being one of the smaller surprise attacks, the Battle of Trenton was certainly devastating, though one could say it was more uplifting for the Americans than it was devastating for the British. in late 1776, the Americans were looking for hope. They had an inspirational stand at Bunker Hill, and a slick retreat from Long Island but those were simply positive spins on American defeats. 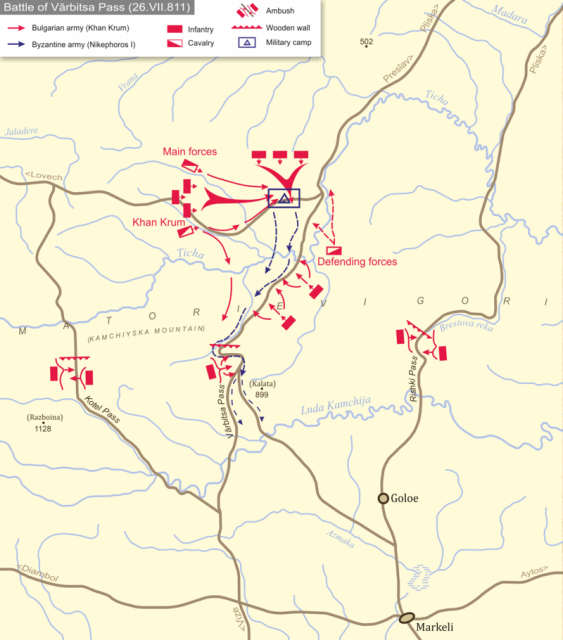 Washington had had about enough, with his troops ready to desert after suffering a string of losses. Washington decided to march his army across the Delaware river to attack the British Hessian contingent stationed in the then small town of Trenton. 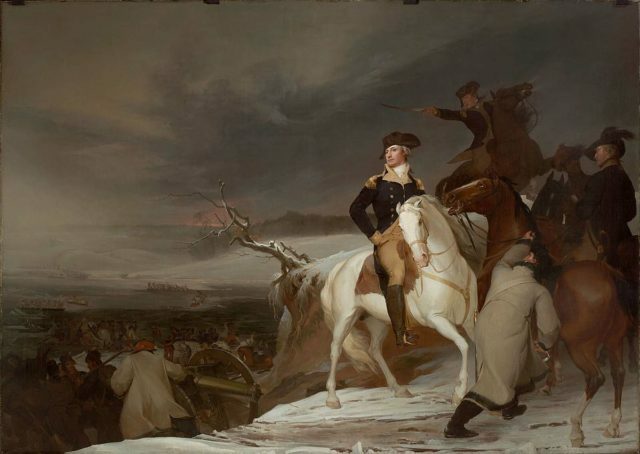 Washington had hoped to take 2,400 of his men across the river north of Trenton by midnight on December 26th. The hoped-for clear weather turned to sleet and snow, delaying the crossing by several hours with several men falling into the icy river. Passage of the Delaware, painting by American Thomas Sully, 1819. The men marched a little less than ten miles in sleet and snow, one group taking the eastern approach, the other hugging the river road to Trenton. At eight in the morning, the attacks started around outposts east of Trenton. The startled Hessians (German soldiers contracted for military service by the British government) fought back and Hessians moved east to confront the attackers. This left the river road open to Washington’s second attack group, who swung through Trenton and secured all of the escape routes. The battle raged through the town of Trenton, with struggles over the few artillery pieces able to fire devastating grapeshot. The Americans never broke and forced the Hessians into tighter areas until the Hessians decided to surrender. 22 Hessians were killed and almost 1,000 captured. Washington lost 2 men on the cold morning march to Trenton but no American was killed in the combat, and relatively few men were wounded. The victory gave great hope to the Americans, especially coupled with victories for the militia and guerrilla operations. Indian troops standing on destroyed/captured Patton tanks. A quick and simple battle, Asal Uttar is a very recent example of a devastating surprise attack. 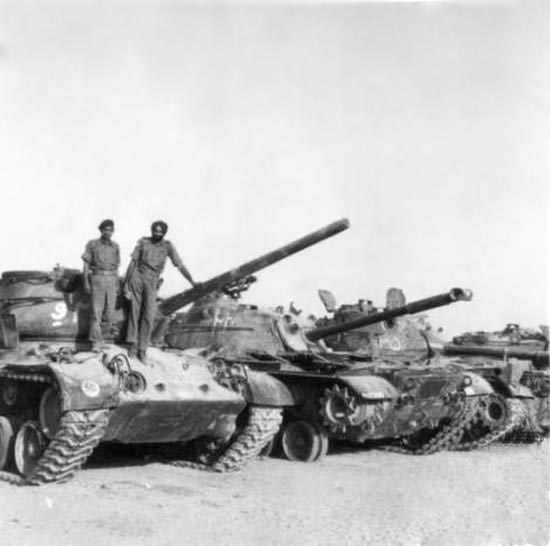 During the Indo-Pakistani War of 1965, India faced a potent attack from the more numerous armored divisions of Pakistan. The Indians had 135 tanks, Centurians, light but effective Shermans and French AMX-13s. the Pakistanis had mostly Pattons, but had almost twice as many tanks at 265. Realizing the disadvantageous situation, Indian General Gurbaksh Singh moved his tanks into a horseshoe position around the sugar cane fields of Asal Uttar and flooded the fields overnight. With their superior numbers, the Pakistani tanks rolled confidently towards the Indian tanks, filling in the horseshoe and becoming bogged down by the muddy field. The numerous Pakistani Patton tanks made easy targets just sitting or slowly trudging through the mud. About 100 Pakistani tanks were destroyed compared to about ten Indian tanks lost. The battle turned the tides of the war from what may have been a Pakistani victory to more of a stalemate. The area of the battle was referred to as Patton City due to the multitude of wrecked tanks forming a village. Eventually, the tanks were shipped throughout India to be put on display.